In the year 2220, only about 15% of Earth's population have survived and thrived after the Nuclear Disaster of 2020. With the collapse of modern society, the population has regressed into eight clans. Amongst these clans, an unusual girl grows from child to adult. Raised on the run and in hiding, Shilo wants to be free of the expectations of women. But in a ruined world where anyone could be an enemy, only the radiation-twisted mutants are clearly identifiable. A fertile female is a precious treasure, and any lapse in caution can mean a loss of the freedom she longs for. Training as hard as a soldier would, in order to free herself from social constraints, she finds herself faced with an offer from a new clan--an offer that provides her with what she desires. But her recently found independence brings discovery, and discovery brings two very different men from her past—and each of them is determined to claim her. So, uhhh, I read this like really amazing book, it's called "Amongst the ruins" and if you don't read it then, uhhh, I guess it's your loss. This books was truly amazing! I received this book from the author in exchange for an honest review. 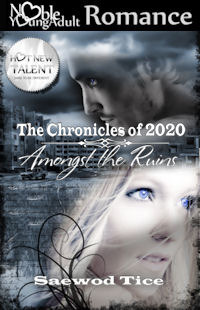 It's the first novel in the promising 2020 chronicles. When I finished reading "Amongst the ruins" I completely fangirled to the author and she hasn't replied yet so I think I scared her? Maybe the part where I told her I "loved" her did it? Ok, so onto the more serious part of the review... Heck, this is going to be so hard to write! I'm still so hyper about the book! I genuinely don't know where to start or what to say to prove how phenomenal this novel was. It's hard to sum up awesomeness in a few paragraphs. Unlike most dystopian novels, whose plots sound promising but fail to deliver, this story really struck me and is now one of favourites of all time. The plot was basic yet seemed so complex at the same time. There were so many twists and unpredictable turns. In the future the remaining 15% of the population live in clans due to the collapse in society after a nuclear disaster devastated mankind. The 'Nigredo" are savage, radiation-twisted mutants, almost human-like if it weren't for their lack of empathy, who threaten to ruin the life mankind has salvaged from their past failures; but they're not all that endanger Shilo's life, freedom and future. Shilo's transformation from a young girl in hiding to a young woman who will stand her ground is compelling and dangerous. Everything she does is to survive. Nothing else matters but survival in this world, but for Shilo, survival isn't enough. She wants freedom from the trap she's fallen into, from the expectations of women in this monster of a world. The characters are what make the story. The characterisation was beautiful and ever so real. The heartless mean fueled me with adrenaline and her friends and family enveloped me in warmth. I felt everything she experienced as if I were her, but at the same time I felt as though I was sat on the side line, unable to help her when my heart was screaming at me to do so. The relationships between characters, whether they were enemies, friends, family or lovers were indecisive, believable and emotional. The feelings characters developed towards one another and the words they wished they'd had a chance to say make you realise just how precious life is. I really can't strain enough how prodigious this novel was. The plot was simple yet layered, the characters all too human and beautiful. A compelling read. An admirable protagonist. Her story will consume you. Hey i am for the first time here. I found this board and I find It really useful & it helped me out much. I hope to give something back and aid others like you helped me.